#1: Our house currently smells like vinegar. No we're not dying Easter Eggs yet, my husband spent the weekend re-calking the aquarium to prep it for life in its new home in the wall. Whatever is in the silicone it emits some sort of fume when it dries and it smells just. like. vinegar. #2: We're testing out this rug for the formal dining room. I like the colors and I love the pattern. The tape is where the rug will be if we buy it in an 8x11 (which is also the biggest size it comes in). We were afraid at first that it might be a bit small, but I think it just might work. I'm thinking of some bright chairs to go along with it (the brown ones are borrowed from the kitchen and won't stay there permanently). 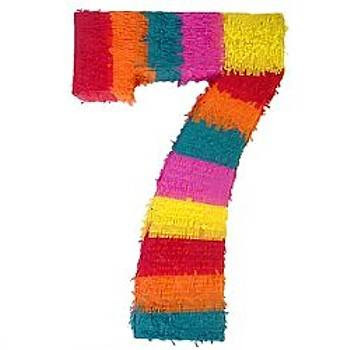 #3: I've been thinking about the number seven! This is my seventh year teaching - wow! How did that happen? And, just for fun - each year I've taught in a room with a seven! In fourth grade in California where we labeled rooms by letter, I was in Room Q - the 17th letter of the alphabet! Then when I taught kinder I was in Room 147, and right now my firsties call Room 127 home. Even when I student taught, I was in Room 17! Love this seven streak! Dr. Klein Visits Room 127! Look What Siri Can Do!